Didyma is an ancient religious site located near Yenihisar in western Turkey. It is situated about 39 mi. [62 km.] 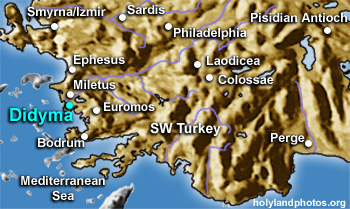 south of Ephesus (as the crow flies). It was the site of a world famous oracle of Apollo (compare Delphi! in Greece). The oldest temple at Didyma was completed about 560 B.C. but destroyed in 494 B.C. by Darius I, the Persian. About 300 B.C. Seleucus I Nicator began building the well-preserved Hellenistic Temple that still stands today. For the next 500(!) years it was under construction. It went out of use during the fourth century A.D. as Christianity grew stronger in this region. People from all over the world would come to Didyma to consult the prophetess here. In addition, every fourth year a festival — including music, oratory, drama, and athletic events — was held here. Technically, Didyma was not a city, but a religious site.